If the Academy were allowed a mulligan – a do-over in retrospect, but a few years later – Stage Door would have offered The Life of Emile Zola almost unbearable competition. For the past eight reviews, all focused on films nominated in 1937, this blog’s format attempted to justify the Best Picture winner using static data that Emile Zola won (it did) and why the other films weren’t better suited (they weren’t), until this one. Stage Door is a superlatively powerful challenger, based squarely on Katharine Hepburn’s broad shoulders, so much so, that given a Mulligan, this film would have taken Best Picture at the 10th Academy Awards of 1945. The two films are essentially incomparable, aside from their temporal and basic technical aspects. The mood in each film taps a completely different nerve, the structural elements of each’s story assumes wildly different story arc depths and each tackles a different synapse of the American Interwar psyche. On one hand, The Life of Emile Zola tackles xenophobia, political resistance and preaches acceptance in response to European democratic devolution and revolt. Stage Door, on the other hand, dives inward into the interplay among varying levels of “together,” in the stifling world of top-level Theater. With dozens of girls and women at different stages of their careers, relationships form from happenstance and from necessity. The only common thread that ties these two films together is that both films concentrate on the actions of people in the face of an uncertain and variable living conditions. Even so, nineteenth century France and twentieth century New York do not seem to intersect culturally or politically until the advent of rapid communication technology via the Internet. Communication is a sticky subject and its contemporary methods look archaic just under eighty years later. Ideas that once took days or weeks to communicate now (in 2015) take seconds; the differences of the advances in communication between 1898, the approximate setting for The Life of Emile Zola and (assuming) 1937 for Stage Door, come nowhere near close to the differences between 1937 and, say, 1977, or even 1977 and 2015. These movies make no sense if we examine them through a modern lens. Take, for example, Zola’s exile to an island off the coast of South America. In 2015, he could be home in hours, but in 1898, months. How would young women find auditions in the modern world? Through a decentralized, cost-efficient social media campaign or through an open casting call, perhaps. Managers and agents still exist, but their roles might have shifted from first-responder to curator of personal brand. But why does this matter? We tackle the differences in these movies based on our modern knowledge because we must; no other perspective exists. So, understanding that communication is key, why should Stage Door have won over The Life of Emile Zola? Because the human condition is not dependent on how we communicate so much, with whom and why. Eighty years later, we refer to Emile Zola (the man) as a bastion of political malfeasance and resistance, blazing a path for open communication, but was a film necessary to capture this phenomenon? Does the very nature of film say this in itself? Stage Door draws on its very nature to reflect the human conditions of vulnerability or uncertainty, both of which transcend the forward thump of time and the technological innovation embedded therein. If we understand this concept as fact, Stage Door would win in 2015. 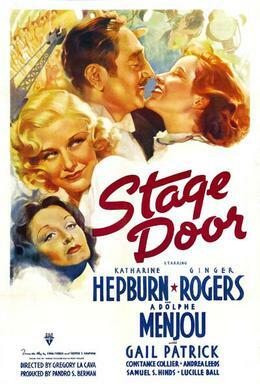 Katharine Hepburn’s and Ginger Rogers’ star power notwithstanding (oh and Adolphe Menjou makes an appearance here, too), the cast is dialed in, and rumor persists that Director Gregory LaCava allowed the women to ad-lib a majority of their lines, though it is hard to pinpoint where and when, which gives Stage Door that sense of realism. Certainly the topics have changed over the years, but not the basic manner in which we interact with one another. And for that reason Stage Door would have better represented 1937, when the world – America – needed a little reassurance of normalcy in the face of a conflagration out East.